If you are interested in learning more about the Yamaha MX88 synthesiser the Engadget website has published a great hands-on review. The Yamaha MX88 has been designed to work with iOS applications, DAW software and software synthesisers on Mac and PC and is now available to purchase priced at around £800. The Design of the MX88 features a Graded Hammer Standard (GHS) weighted action offering a heavier response in the low keys and a lighter response in the high keys. Check out the video below to learn a little more. The MX88 is more than a great-sounding synthesizer; it’s the hub of your studio! The MX88 is USB audio and MIDI class-compliant, letting you record and playback stereo audio to and from your computer or iOS device. This is perfect when recording the MX88 into your DAW and listening to your mixes through speakers or headphones. The MX88 does more than connect to your DAW, it’s also a dedicated control surface. Use the onboard transport controls with your DAW and interact with plug-in parameters via the control knobs. There are dozens of built-in Remote Control Templates for interacting with popular softsynths and plug-ins, giving your software a hardware feel. With DAW remote control capabilities, there’s also a 16-channel MIDI interface for using the MX88 as both a keyboard controller and tone generator. 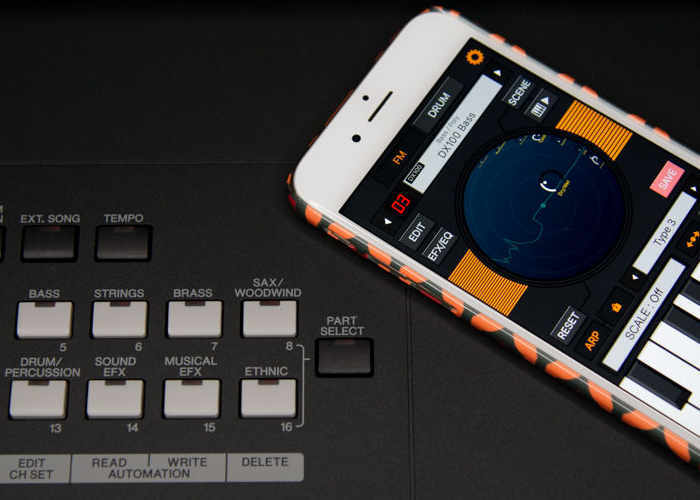 FM Essential is a FREE 4-Operator FM synthesizer app for iOS. The standard version features 10 Voices, but connecting the MX88 Music Synthesizer (via the Apple Lightning to USB Camera Adapter – not included) unlocks a full 271 FM Voices from classic ‘80s to cutting-edge modern EDM. Full Voice editing capibilities are also unlocked. FM Essential also features built-in effects, EQ, drum phrases and a step sequencer for automating your control changes. More details full specifications on the Yamaha MX8 jump over to the official Yamaha website by following the link below, or over to Engadget for a hands-on review.